The Bulgarian Medical Association has announced that doctors will hold a national strike on April 7, to protest against wage cuts and the government’s health reform. 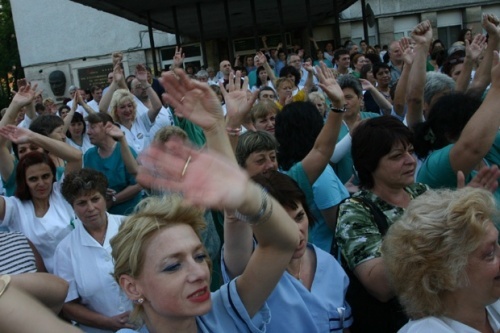 The strike entitled ‘Day of Health-Day of Protest’. The BMA also stated that doctors from around the country will decide in what way they want to protest. Earlier Bulgaria PM Boyko Borisov reassured Bulgarian doctors that the ceiling on their wages will only be a temporary anti-crisis measure. Borisov, speaking to the Bulgarian Medical Association at their annual Council meeting, said that when his government manages to “stop the leaks” and to cope with the losses from energy projects such as Belene NPP and Tsankov Kamak doctors wages will be increased rhythmically. He said that the ceiling of BGN 3500 placed on doctors wages would only be temporary and that when the crisis is over the best doctors will “again be able to receive BGN 50 000 monthly”.